HAISU is a portmanteau of three Japanese words - 'hairu', to enter, 'su', number, and 'hausu', an English borrow word meaning house, of course. Together, we get a meaning of 'enter number house', which I have roughly translated to English as 'Room Count'. 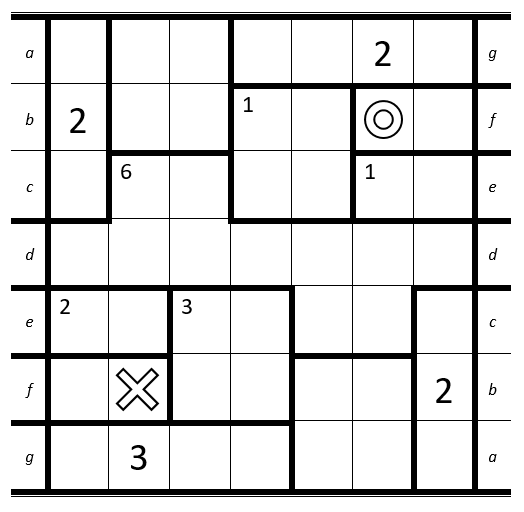 The rules are simple - draw a path from the O to the X, passing through every cell in the grid exactly once. The grid is divided into several rooms. When your path passes over a cell with the big number N, it must be the Nth time you have entered the room. If a room has a small number m in the top left corner, you must enter that room a total of m times. This puzzle is a bit different, however: it is embedded on a Möbius strip. The top and bottom act like normal, but the left and right edges join up as shown by the letters. Good luck! The letters aren't their own cells, they just tell you where to join the two sides up. The rooms do not connect between the two sides of the puzzle (e.g. if an edge passes through d it will leave and enter the room again). 1. 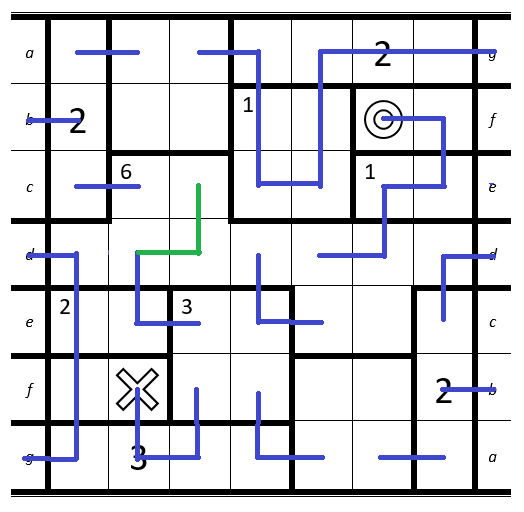 Top-Right: Cell with the 2 can't be connected to the O. 2. Below the O: Room has to be entered exactly once -> cells have to be connected to each other. 3. Bottom-Left: Only way to hit the 3 on the third entrance since it is next to the X. 1. Bottom-Left: Cell only has two free neighbour-cells left. 2. Bottom: Cell only has two free neighbour-cells left. 3. Top: Room with the 2 must be entered at least two times + the room below can only be entered once -> all cells have to be connected to each other. 1. Top-Right: Connect the Möbius strip. 2. Above the X: Room has to be entered two times and has two cells -> they can't be connected. 3. Next to it: Room has to be entered three times -> top-right cell can't be connected to any other cell in the room. Now it gets a bit more complicated since we have to consider the direction of the path. 1. 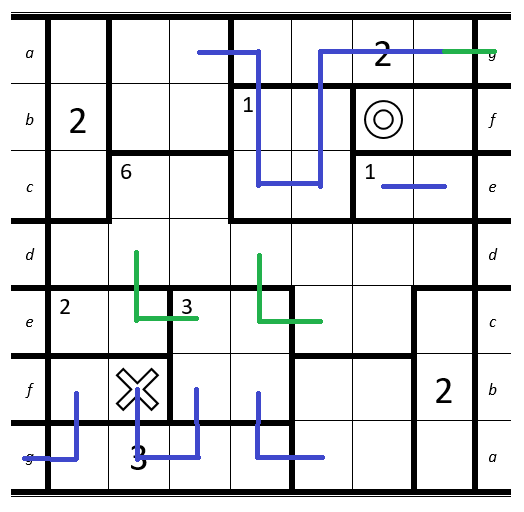 Bottom-Left: The path on the bottom-left is connected with the top-right. At the top-right the direction of the path is from left to right since we have to pass the 2 on our second entry. 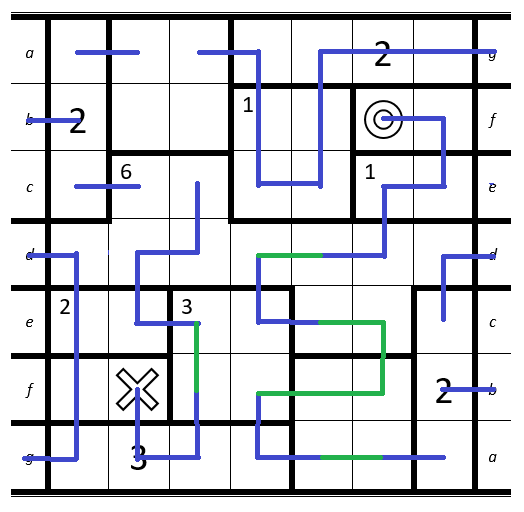 Therefore if we would connect the bottom-left path with the e or the f we would always end at the O which would lead to a direction-conflict. 2. 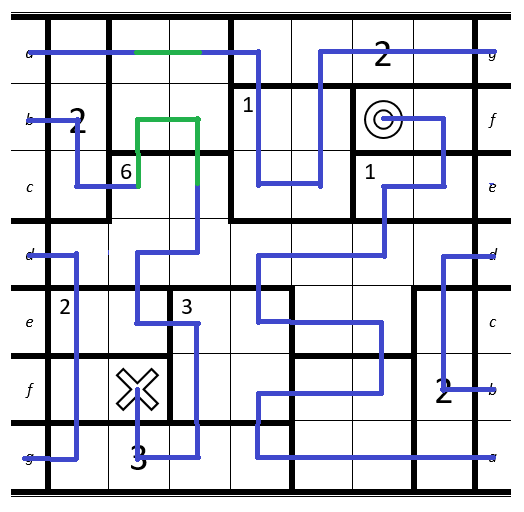 Top-Right: Since we can't use e and f any more, this is the only possible path to connect the cells. 1. At the red arrow: The cell can't be connected to his left and his lower neighbour at the same time -> has to be connected to his right neighbour. 2. Right: Cell only has two free neighbour-cells left. 3. Left: Complete the connection with d.
The next step is even more complicated. From now on I will call a move from one side to another (by connecting two letters) a Möbius-Move. 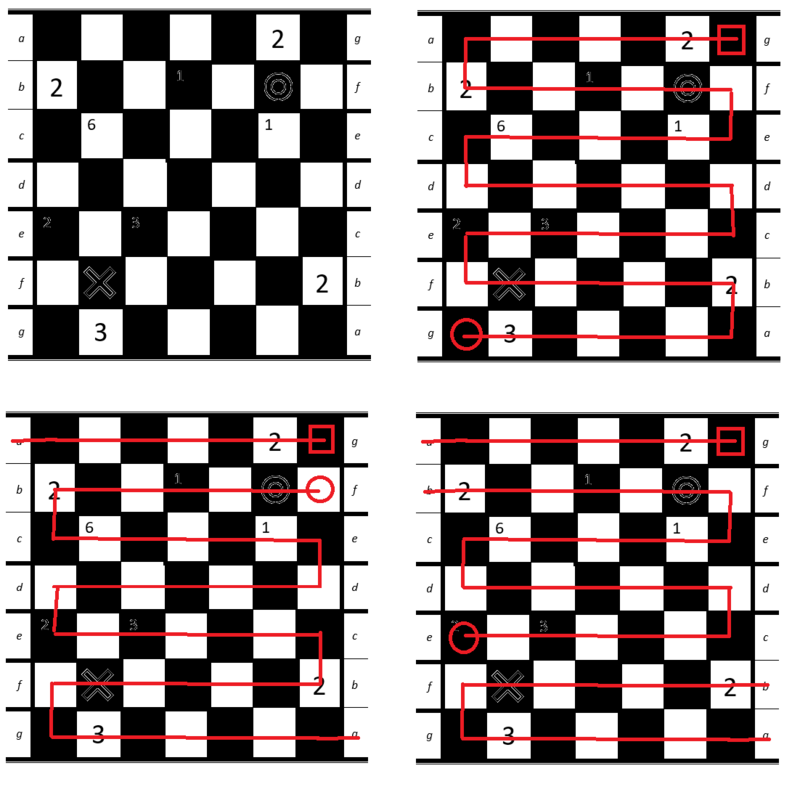 Since the puzzle is a square with an nxn amount of cells, we can color it in a black/white chess-pattern (like in the next picture in the top-left quarter). Let's try to connect all cells starting from the top right corner without using a Möbius-Move. You will see that the path will always end in a black cell (for example: top-right quarter in the next picture). Now we do the same thing, but we will use exactly one Möbius-Move. 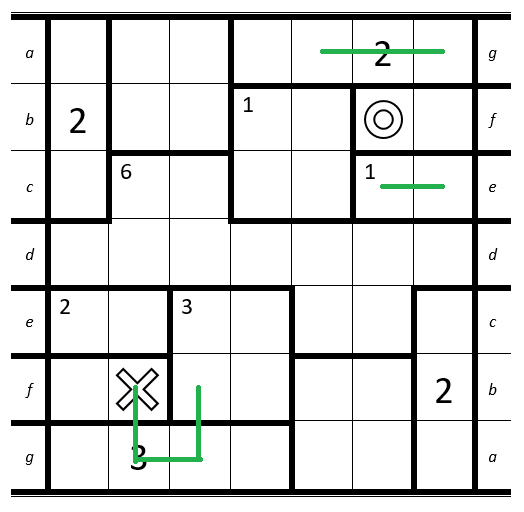 Now the path will always end in a white cell (example: bottom-left quarter). Last but not least we try the same thing again, this time with two Möbius-Moves. 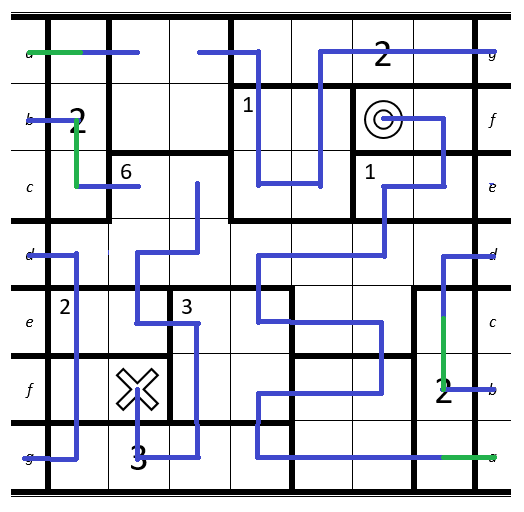 And the path will end in a black cell (example: bottom-right quarter). The cells with the X and the O both have the same color, so we can conclude that we need an even number of Möbius-Moves. We already used two Möbius-Moves and there are three letters left that could be connected, so we have to either use two more or no more Möbius-Moves. Take a look at the room in the top-left corner. 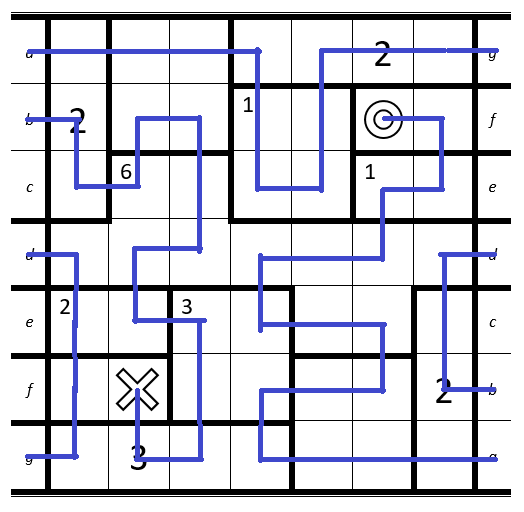 Since the room has to be entered at least two times and has an odd number of cells, it is not possible to find a solution with no more Möbius-Moves. Now we know that there are exactly two more Möbius-Moves left. Let's assume we would do a Möbius-Move at a and c. As you can see in the image, this leads to a problem in the bottom-right corner. Therefore we now know that there has to be a Möbius-Move at the letter c.
We already know that we have to enter rooms in the top-left and the bottom-right corner exactly two times. We enter them two times with a Möbius-Move, so we have to leave them two times with a normal move. Now take a look at the cells inside the red frame. There are four path-ends inside the frame. Let's assume we would connect the two paths at (1). Now we would need an additional path going upwards at (2). Now there would be three path-ends at the top-half of the red frame, which would lead to an incomplete path. Now we just do some basic path-connecting. Not much logic required. 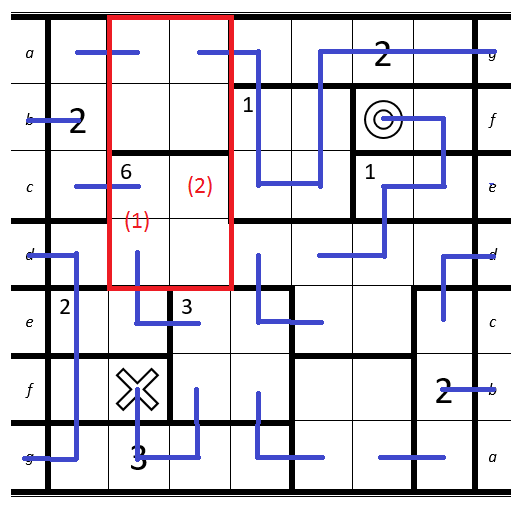 Bottom-Right: The cell with the 2 has to be passed at the second entry. Now to finish the puzzle, we just have to connect the last cells. The only possible way to enter the room with the 6 six times, is by leaving and re-entering it. Not the answer you're looking for? Browse other questions tagged grid-deduction or ask your own question.